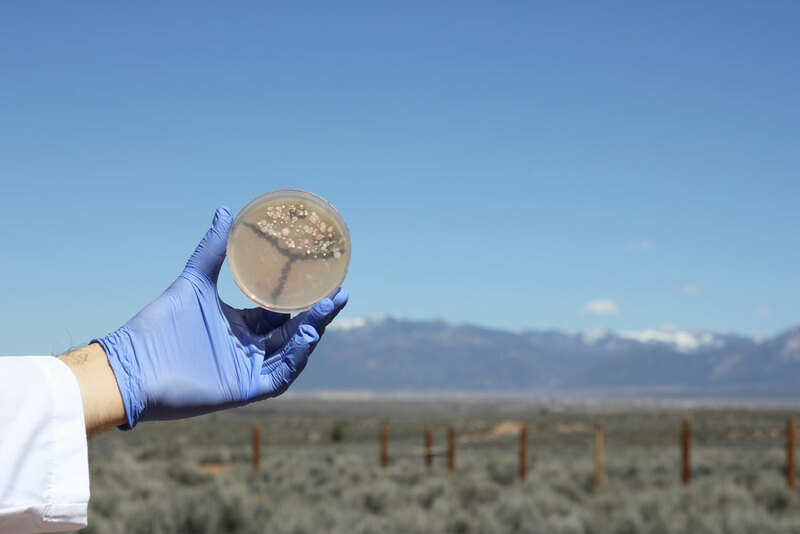 Earth Optimism Santa Fe connects globally and acts locally to feature the work of artists, students and scientists responding to environmental challenges and opportunities. We are a sister event of Earth Optimism, a global program coordinated by the Smithsonian Institution in Washington DC and connected to the UNM Art & Ecology’s Decolonizing Nature Conference. Our aim is to celebrate the systems that keep our soil (and us) healthy. Featuring electronics pioneer Leah Beuchley, bio artist Mick Lorusso in a collaboration with Joel Ong , artist and designer Catherine Page Harris, Marfa-based artist Elise Sibley Chandler, biologist Renee Bronwyn Johansen and bio art and design students Kaitlin Bryson and Sabrina Islam. The event will also mark the launch of a work by Navajo Nation-based photo muralist and member of the Justseeds collective Chip Thomas. Mick Lorusso and Joel Ong have created windows into the microbial world, where dirt samples from the regions incubate and breed curated microbiomes. Interactive elements perturb the dust samples, further revealing narratives and metaphors of environmental disruptions at a global scale, providing the context for a uniquely microbial perspective of the world.